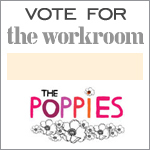 I just found out yesterday that the workroom/make something had been nominated for a Poppy award under the ‘Favourite Handmade Crafter’ category. How sweet! The Poppies are a brand new virtual awards event to give recognition to all the awesome talent out there, put forth by the wonderful crew at Poppytalk. Every day for the next week, a new category will be announced and you can vote for your favourites in each category. You can vote once per day for the entire week for each category. There are so many great people represented, so it’s a wonderful opportunity to discover some new crafty shops and blogs. There is stiff competition in the crafters category. Atlantic Treefox, Film in the Fridge, Leptitpapillon, Miniature Rhino, Resurrection Fern, Sandra Juto, Stitchface, and Yokoo are just a few of the folks in the running! Vote for your Favourite Handmade Crafter here! congratulations on the nominations lady! You got my vote and I will spread the word!! !